 The Revised Uniform Unclaimed Property Act (RUUPA), finalized in July 2016, was the result of an enormous undertaking by the holder community, industry groups, and state administrators alike. These groups joined forces to create a model act that enables the states to modernize their outdated unclaimed property laws, which were primarily based upon prior versions of the Uniform Unclaimed Property Act, initially promulgated in 1954 and most recently amended in 1995. RUUPA addressed technological advancements by introducing new property types subject to escheat, new triggers for the escheatment of existing property types, and providing additional owner outreach requirements. In addition, dormancy periods were reduced, a clear statute of limitations and record retention requirement were put in place, and an administrator was limited in the amount of time securities could be liquidated after receipt. RUUPA was not simply a “facelift” designed to adapt unclaimed property laws to changing technology, but represented a joint effort by holders, advocacy groups, and the states to address mutual concerns. As such, the RUUPA is a compromise – an imperfect model act. At times paralleling the RUUPA effort, the ABA Model Act was designed specifically to address the constitutional concerns and shortcomings found in RUUPA, including due process and takings clause concerns, resulting in longer dormancy periods, a shorter statute of limitations, and the deletion of the transitional/retroactive provision. The ABA Model Act is driven by the Derivative Rights Doctrine, tangentially addressed in RUUPA, which holds that the state has no greater right to the property than the owner of such property. This is particularly evident in the deletion of the contractual anti-limitations provision. To abide by foreign laws and treaties, and arguably constitutional law, the ABA Model Act prohibits the escheatment of foreign-owned property. Guided by policy reasons – owner/consumer protection (versus protecting businesses), the ABA Model Act includes a broad business to business exemption, which is an optional exemption under RUUPA, as unclaimed money “owed” by one business to another is usually attributable to accounting errors or disputed amounts. The current version scales back many of the protections won by the securities industry during RUUPA negotiations and that were agreed to by NAUPA. The revisions pertaining to securities illustrate the states’ desire to revert to a pure inactivity standard, rather than the lost or returned mail trigger for escheatment found in both RUUPA and the ABA Model Act. Employing an inactivity-only standard for securities, retirement, and custodial accounts would trigger earlier escheatment and would not adequately protect owners. The revisions also limit the liability of the state to make the owner whole following liquidation of securities. These provisions were not only heavily negotiated in RUUPA, but the lost shareholder standard also follows the Securities and Exchange Commission Rule 17Ad-17 and provides the necessary safeguards for owners. The NAUPA revisions are heavily based on, and in fact rely upon, the new Illinois RUUPA, which was introduced in a budget bill and passed before the holder community could review and provide comment. These revisions mark a departure from RUUPA and include an acceleration of the dormancy period for deceased owners to two years and a statute of limitations that permits examinations at any time of property not previously reported, allowing for a lookback only if the property was specifically identified in the report. To date, Delaware, Utah, Tennessee, Illinois and Kentucky have adopted at least some portion of RUUPA when revising their unclaimed property laws, resulting in new “RUUPA-like” laws. New bills were also introduced this year in Colorado, District of Columbia, Maine, Minnesota, Nebraska, Vermont and Washington, some of which adhere to RUUPA standards more than others. Specific property types that are excluded from escheatment. Optional exemptions for business to business transactions, gift cards, and merchandise credits. Mandatory exemptions for business to business transactions, gift cards, and merchandise credits. Comment – “Either strike the exemptions and leave it to the individual states to decide or selectively delete exemptions.” (see IL – no business to business exemption). The period of time that property is in the holder’s possession before it is considered abandoned. Many dormancy periods shortened from 5 to 3 years. Wages and commissions, other than amounts on payroll cards: 1 year. Increased dormancy periods to 7 years for certain property types (bank accounts) and reduced others (uncashed checks: 1 year). 5 years for payroll checks. Shortens dormancy periods for payroll cards to 1 year. Other dormancy periods not determined. If holder imposed an inactivity fee or the owner failed to claim the property within a specified period of time and the abandonment period is greater than 2 years, the property is presumed abandoned 2 years from the date of the owner’s last indication of interest in the account. Property type classifications that account for new technology. Health savings, education savings, and custodial accounts – 3 year dormancy periods. Health savings, education savings, and custodial accounts – 7 year dormancy periods. Health savings, education savings, custodial accounts are escheatable and also includes provisions for pre-need funeral funds (other than interment rights) and terminated retirement plans. HSAs/ESAs - additional possible trigger: the date the holder confirms or receives confirmation of death of the owner in the ordinary course of business. The event triggering the running of the dormancy period for a deceased owner’s IRA account. The earlier of the date the owner turns 70.5 or 2 years after the date the holder receives confirmation of death during the ordinary course of business or confirms death. The earlier of the date the owner turns 70.5 or 2 years after the date the holder receives confirmation of death during the ordinary course of business or confirms death. The earlier of the following dates: 70.5 or 1 year after date of mandatory distribution following death if the IRS requires distribution to avoid a tax penalty and the holder receives confirmation of death during ordinary course of business or confirms death. The running of the dormancy period is triggered by different events depending on which securities provision is chosen by the state. 3 years + returned mail. 7 years + returned mail. 3 years inactivity only. No use of RPO. Or alternately would consider Illinois’ hybrid standard of inactivity and RPO: the earliest of 3 RPO or 5 years inactivity. Would also add a certified mail component to the due diligence requirement: if the holder has an address that the holder’s records do not disclose to be invalid + the value of the securities is $1000 or more. The right of a state to liquidate securities after a certain period of time after receipt and notice to the owner. 3 years after receipt + notice to owner. Owner is made whole only if liquidation occurred within 6 years. 7 years after receipt + notice to owner. Owner is made whole only if the state elects to liquidate the securities. 3 years after receipt + notice to owner, unless administrator determines that liquidation prior to the expiration of the 3 years would be in the best interest of the owner and notice is given to the owner. Owner entitled to replacement of the security; net proceeds of the sale + dividends and interest up until the time the security was sold; or the market value at the time the claim is filed, plus dividends and interest, up until the claim is paid. Must take into account stock splits or similar corporate action. If a valid claim is made > 3 years, owner entitled to the security if it is still in the administrator’s custody, plus dividends and interest up until the administrator delivers the security to the person, or the net proceeds of the sale plus dividends and interest, up until the security was sold. Refers to property owned by owners that reside outside of the United States. The holder’s state of corporate domicile is often used to determine which state’s law applies. Escheat by state of domicile is permitted unless specifically exempt in the foreign jurisdiction. Specifically prohibits escheatment of any foreign owned property. Would delete language pertaining to the domiciliary state and sections controlling the transaction rule in the RUUPA. The period of time of time that a holder is required to maintain records relating to unclaimed property. 10 years after the later of the date the report was filed or the last date a timely report was due to be filed. 7 years after the later of the date the report was filed or the last date a timely report was due to be filed. 10 years after the later of the date the report was filed or the last date a timely report was due to be filed. The records required must include documentation for items that were considered for reporting but were not ultimately reported to allow examination to determine compliance. Limits the period of time that a state can bring an action against the holder to enforce the state’s unclaimed property laws. No enforcement more than 5 years after the filing of a non-fraudulent report and no more than 10 years after the duty arose. No enforcement more than 3 years after the filing of a non-fraudulent report and no more than 7 years after the duty arose. 10 years after express notice to the administrator regarding specific property not reported or remitted. In the absence of express notice, the period of limitation is tolled. The period of limitation is also tolled by the filing of a fraudulent report. Provides that the expiration of a contractual period of limitation on an owner’s right to claim the property does not prevent the property from being presumed abandoned. State’s rights > owner’s rights; violates the derivative rights doctrine. Purposefully excluded. Not determined but IL includes such a provision. Violates the derivative rights doctrine. The state’s right to take custody of abandoned property, allowing the state to “stand in the shoes” of the owner. Alluded to in prefatory note of the Act but not addressed throughout. Addressed throughout the Act. Not determined. A method used by a state administrator or third-party auditor to calculate liability for time periods where records do not exist. Administrator may use estimation at reasonable times and on reasonable notice to determine compliance with the Act. Administrator has the burden of proving that the property is presumed abandoned and is subject to escheat – if met, estimation can only be used as a penalty for the failure to maintain records. Estimation permitted. A payment made based on estimation is a penalty for the failure to maintain the records required and does not relieve a person from the obligation to report and deliver property to the state of domicile. In a contingency fee audit, contract auditors are paid on a contingent fee basis to perform unclaimed property audits. Permitted – suggested 10% cap. Prohibits the use of contingent fee based audits and auditors. Permitted – 15% cap. A provision that indemnifies holders against the state’s disclosure of confidential information. A provision requiring holders to apply the new law retroactively for a number of years as if the new law was in effect at that time. New escheat provisions are retroactive. No transitional provision. Not determined in the April 2018 documents. Should NAUPA finalize its version of RUUPA, the states would be presented with three distinct model acts for consideration when revising their laws. Depending on the version, provisions may be holder/owner friendly, primarily beneficial to the state, or likely some hybrid of all three acts. With RUUPA representing the compromise(d) middle ground, the holder community should continue to closely monitor newly introduced bills, particularly those which would incorporate the NAUPA provisions as drafted. Additionally, holders should continue to work with industry groups to advocate for greater holder and owner protection and promote the use of RUUPA, the ABA Model Act, or perhaps even a blend of the two. Go from A Comparison of the 3 Unclaimed Property Uniform Models back to the Fall 2018 issue of Keanotes.